You have got to give these a try!! This was another recipe from Mexican Made Easy, my favorite Food Network show (other than Paula Deen of course). I was a little skeptical at first, ground turkey? Weird? All I can say is that these are my new favorite Sloppy Joes, the best I've ever had. The ground turkey was not weird at all, in fact I loved it. The corn is a must in this recipe, do not leave it out. 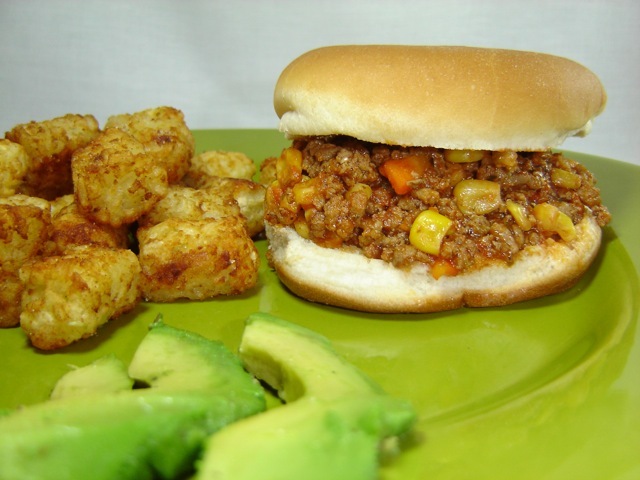 I promise this is way better than any Sloppy Joe you have ever had, so give them a try. By the way, I was worried that ground turkey was going to be expensive, but I got 1 Lb. for $2.43 which is pretty cheap if you ask me. Heat vegetable oil in large skillet. Add the onion, celery and carrots; saute a few minutes or until tender. Add corn, garlic and jalapeno; saute another minute. Add the ground turkey and saute until cooked through. Stir in the tomato sauce, bay leaf, thyme, oregano, salt and pepper. Reduce heat to medium, cover pan & cook for 10 minutes. Discard the bay leaf. Serve on hamburger buns with fresh avocado slices. Serves: 5-6. I have not seen that show yet. I bet I would love it. I love Mexican flavors! My family loves mexican and sloppy joes so I bet these would be delicious to try. ps- every Wednesday I feature recipes from all around blogland and I'd love for you to stop by! I`m planning to try this recipe with dry herbs,do you remember how much did you use? I think I used between 1/2 teaspoon - 1 teaspoon each. I would start with less and add more if you think it needs it.